Embarking on a short day trip from Bangalore is invariably a much sought after option with most tourists. 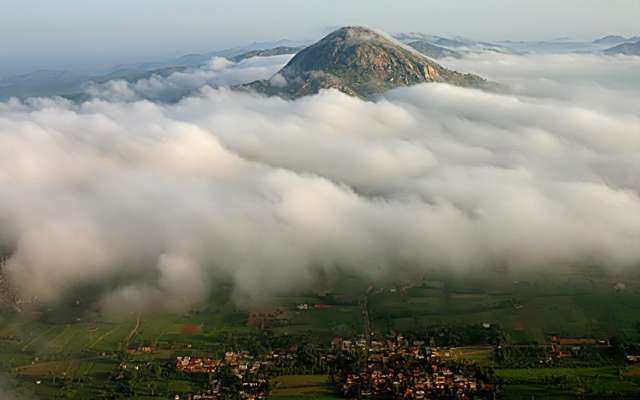 From natural rock formations to bewitching waterfalls, the places near and around Bangalore cater to satisfy every traveler, whether he is visiting alone or with family. Take a glimpse of the below-mentioned sites to make your day trip fulfilling. Lying within 100 to 150 km, Mysore is also called “The city of palaces” for housing magnificent architectures glorifying the Tipu Sultan era as well as the British Raj. Take a bus from the Kempegowda bus station in Majestic, or board any of the trains like Chamundi, Kaveri, or Mysore Express from Bangalore railway station. You may also drive the whole way by taking the Mysore Road (SH 17) via Kanakpura, Malavalli, and Bannur. Start off with Mysore Palace, just 1 km from the main bus stand and thereafter, head to the other notable landmarks like the Brindavan Gardens, Mysore Zoo, Jaganmohan Palace, and St. Philomena’s Church. 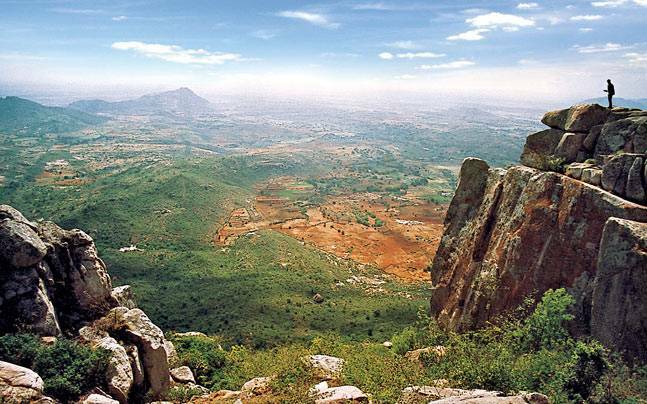 Drive to the Chamundi Hills, about 13 km from Mysore, for a stunning view of the city. 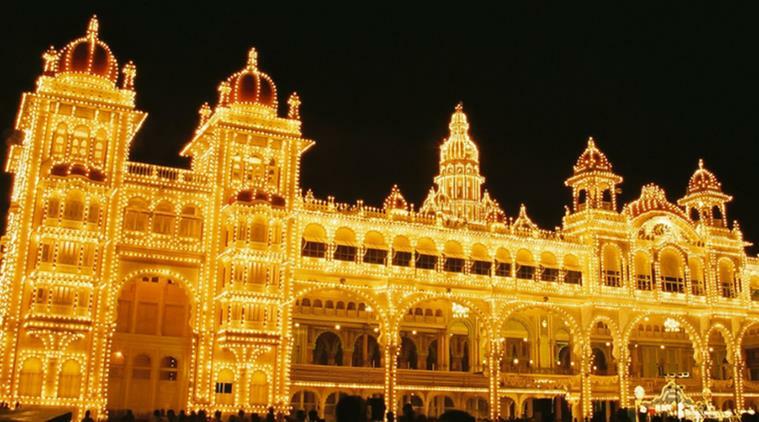 Turn up for an awesome light and sound show, held every day from 7 pm to 7.45 pm at Mysore Palace. Food is not allowed both in the Mysore and Jaganmohan Palaces, however, at Brindavan Gardens, there are food counters and vendors. There are lots of restaurants in Mysore to have lunch at before resuming your journey. Toilet facilities are available at both the palaces. 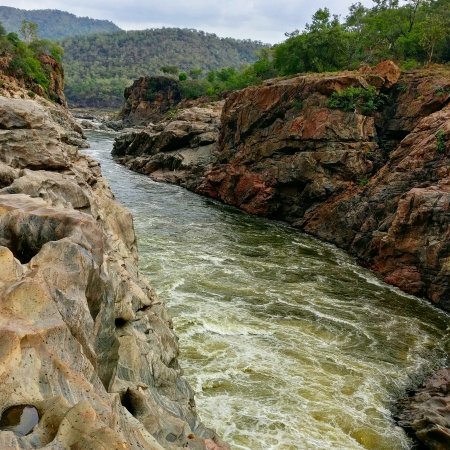 This small town, at a distance of 135 km from Bangalore, gains prominence on account of the two waterfalls, Barachukki, and Gaganachukki that originate from the river Kaveri. The first option is boarding a bus from KSRTC Satellite Bus Stand to Kollegala, and thereafter hiring an auto to get to the falls. The second one entails hopping into a cab from either Bangalore or Mysore, and it is better since the buses are often overcrowded. 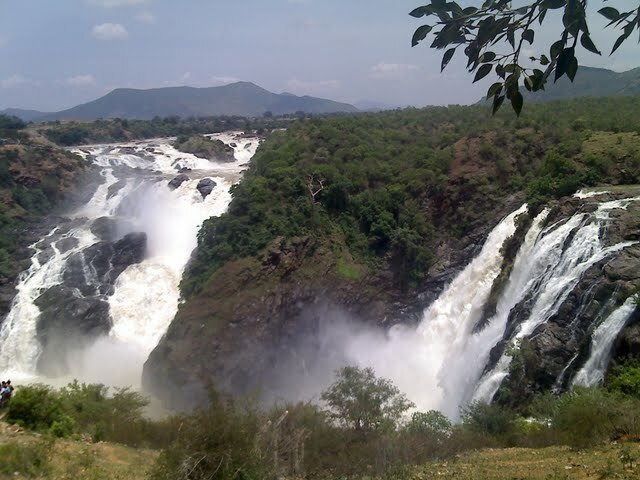 The 2 falls are 14 km apart and since no public transportation is available between them, you need to return to the main road so as to drive to Barachukki. Feast your eyes on the falls from a distance and if you wish, take a dip in Barachukki (it is safer as the water levels are lower). A ride in a coracle boat would enable you to relish the lush greenery in the surrounding.If you can manage some time, consider visiting the Ranganatha Swamy temple in Madhyaranga, just 2.9 km from the town. Though there are stairs leading to the base of the falls, you are not permitted to descend for strong currents. There is a small restaurant at Gaganachukki falls where you may finish lunch. However, it’s best to carry your own food. Besides, the Bangalore Mysore highway features plenty of eateries, popular for serving traditional items from Karnataka. 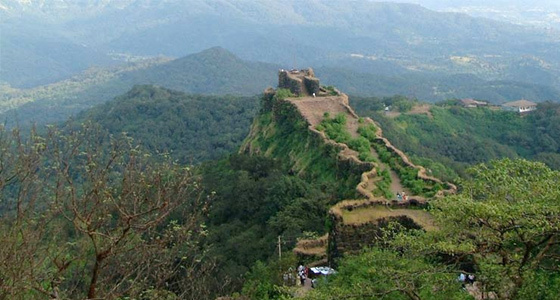 Deriving its name from the Hindu deity ‘Nandi’ this hill fortress is much favored for the breathtaking panoramic views. It is also known by the names, Nandi Betta, or Nandidurg. The prime way to get here is by a car, directly from Bangalore since it allows you to take in the delightful views while driving via NH 7. Get here before sunrise to relish a stunning view from the hilltop and henceforth visit the local Yoganandeeshwara Temple to gaze at the magnificent statue of the deity, Nandi, stationed at the doorway. The famous Tipu’s Drop, a place from where guilty people were thrown down to wolves in ancient days is another place of interest. Gear up for an early morning visit since the place gets crowded soon. There are 2 restaurants, a few coffee shops, and a snacks bar at the top of the hills. In comparison to the others, the KSTDC restaurant is more hygienic. This small village, about 180 km away in Tamil Nadu, marks the place where the Kaveri river splits into a number of streams, thereby giving rise to a waterfall. The name is derived from two Kannada words, “Hoge” meaning smoke, and “Kal” meaning rocks” thereby suggesting “smoky rocks”. 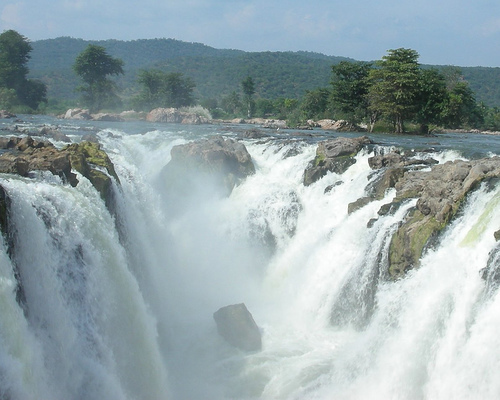 Also called as “Niagra of the East” the place has been the site of many famous movies like Roja’ and ‘Raavan’. If you go by car, there are a number of routes with the shortest being via NH 7. Since there are no direct trains from Bangalore, you need to take the Ernakulam Express to Dharmapuri and thereafter hire a taxi. Board a local boat or ‘teppa’ to enjoy the scenery, or refresh yourself in the medicinal water of the cascade. There is a small iron bridge from where you would get a fantastic view. If time permits, visit the nearby Melagiri hills (48.5 km). It’s advisable to carry a bottle of water, and some packaged food, since most of the food counters serving non-vegetarian items and are not very hygienic. For light snacks, you may try fried fishes sold in plenty by vendors. Avoid going during the monsoon for the river gets turbulent and coracle boat riding is not allowed by the government. 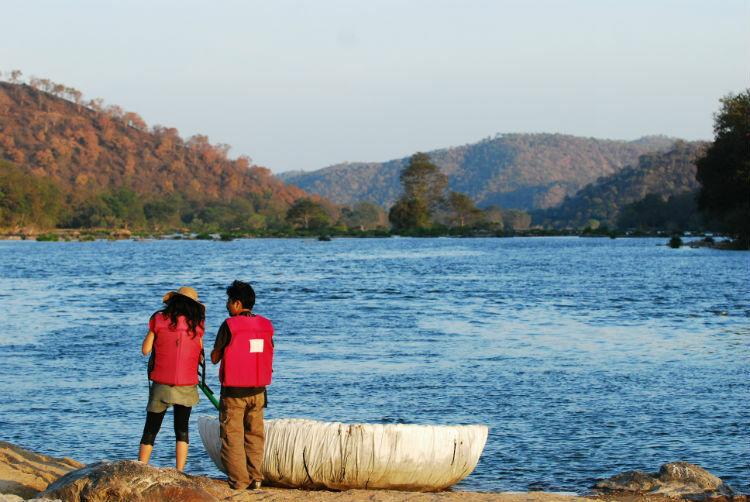 Located in a jungle, Bheemeshwari presents ample opportunities for outdoor activities like camping, and boating. Since Bheemeshwari doesn’t have a rail station, and the nearest railhead, Bangalore is at a distance of 81km, most prefer going by cabs. There are 2 routes available: one is via Kanakapura road and the other via Mysore road. Feast your eyes on the variety of birds such as cuckoo, green-billed malkoha, white-browed bulbul, and the pygmy woodpecker. Novice anglers may try ‘catch and release’ fishing to see the largest recorded tropical game fish “Mahseer”. For seeing crocodiles, you need to avail a coracle ride in the backwaters. Accommodation facilities in tents and cottages are available in the nature camps but they need to be reserved beforehand. Regarding food, you may check some of the local shops, or carry your own. Lying on the northernmost tip of the Nilgiris, this hill range is covered with lush forests, featuring a wide range of flora and fauna. 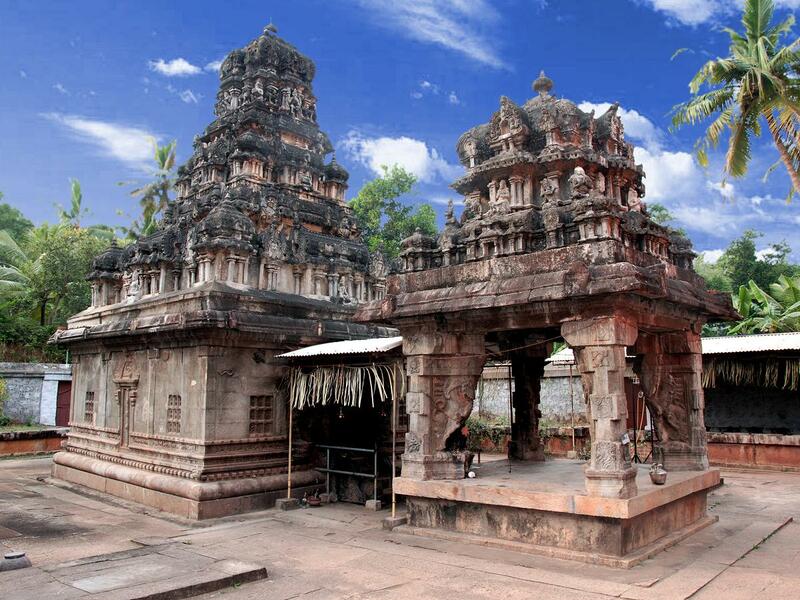 It derives its name from the Biligiriranga Swamy Temple, stationed close by. The area, also called BRT Wildlife Sanctuary boasts of a unique ecosystem and is a protected reserve of nearly 26 mammal species including the Asian tiger, elephant, gaur, sambhar, chital, barking deer, the rare four-horned antelope, and the stealthy leopards. BR Hills lies within 200 km from Bangalore and can be reached via train, bus or cab. Since the nearest railhead, Mysore is at a distance of 64 km, most consider going either by bus or car. You need to board a bus from Chamrajnagar KSRTC Bus Stop or a cab to take the Chamarajnagar route to enjoy the scenic views. Turn up at the spiritual site, Dodda Sampide Mara, meaning big Champak tree, then take a round of the temple of Lord Rangaswamy, located close by. Thereafter, you may entertain yourself by seeing the unique handicrafts of the Soliga tribe that calls the place their home. Opt for a jungle safari in the BR Tiger Sanctuary, about 20 km from Lord Rangaswamy temple. The timings of the jungle safari is at 8 am and again at 3 pm. Buy tickets as soon as you reach to avoid a long queue. For South Indian meals, breeze into the Mayura Prakriti restaurant run by the Karnataka State Tourism Development Corporation (KSTDC). A restroom and public toilet are present near the temple but they do not remain open all day. One of the most endearing factors of this hill station atop 4,100 ft is its relaxing climate – it ranges between 20°C and 32°C even in summer. Named after W.D. 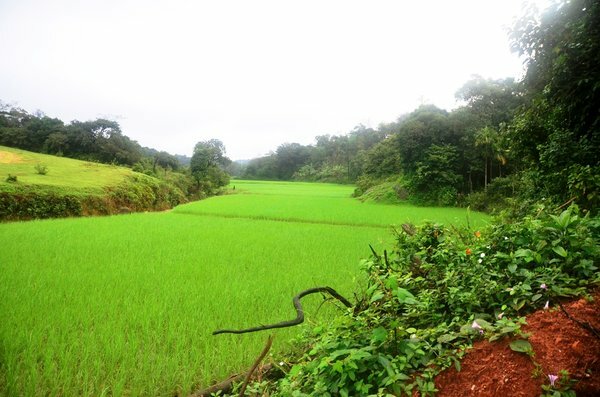 Horsley, the authority of Cuddapah region, it is filled with hill slopes rich with trees like Gulmohar, Allamanda, Reeta, Amla, Beedi leaves, Blue Gum, Eucalyptus, and Sandalwood. It is ideal to reach by a car from Bangalore, as the view all along is fantastic. Its varied viewpoints present amazing sights and there’s also a huge banyan tree, commanding an area of 8 acres. For those interested in history, take a drive down to the foothills to visit the city, Madanapalle, where Rabindranath Tagore translated our National Anthem into English. There’s also a small zoo and park nearby for kids. You may have your meal at the only hotel nearby, run by the Andhra Pradesh state government tourism development. 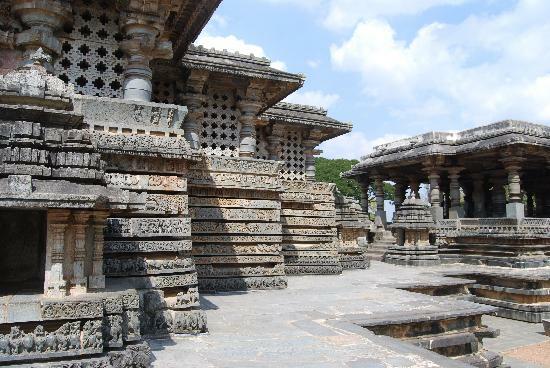 Halebid or Halebidu, in Karnataka’s Hassan District, is noteworthy for the delicately patterned temples of Hoysaleswara, Shantaleshwara. and Kedareswara of the Hoysala period. A bus journey takes nearly 7 hours, so its best to go via cab from Bangalore, though it also takes about 5 hours. Marvel at the architecture of the twin temples, chiefly, their star-shaped platform. Inside the complex, there is a museum containing a massive collection of items found in the surrounding area. A drive to Belur, only 30 km away, would enable you to see the Chennakeshava Temple, the Kappe Chennigarya, with its 6.5ft tall statue of Chennakeshava. Guides are available only for large groups. Have lunch at any of the restaurants there, and quench your thirst with the tender coconut or cane juice offered by numerous stalls in the vicinity. Nestled in the Western Ghats, this picturesque hill station abounds in coffee and cardamom plantations along with waterfalls and ancient forts. Either take a cab or board a train from Bangalore railway station. There are different trekking options such as those to the Murkannu Gudda and Hadlu Waterfalls (about 8km trek), or to Ombattu Gudda (24km) and Bisle Ghat. But before proceeding, attend a briefing session organized by experts. A picturesque man-made lake enroute would allow you to take a dip if you wish. For a less active outing, you may leisurely ramble the premises of Pandavar Gudda or Manjarabad Fort. There are copious restaurants in the vicinity but it’s better to carry light snacks, as seeing all the places may demand more time. Called the “Golden City of India” for its many goldfields, Kolar is also notable for some eminent historical temples and caves. Get to Kolar by either availing a cab or bus from Bangalore. Start off with the prominent temples of Someshwara, located near the Fort area and Kolaramma, at a distance of 100 m from Someshwara. Follow it up by exploring the Antharagange caves, (4 km from Kolar). The timing of Someshwara temple is from 7 am to 11 am in the morning and that of Kolaramma temple is from 5.30 am to 1.30 pm and again from 5 pm to 8 pm. Before commencing your trip to the Antharagange caves, buy some dry snacks as there are no stalls present, but guard them properly or they may be snatched away by monkeys. This well-known picnic spot, about 90 km from Bangalore takes its name from a narrow gorge that can be crossed even by a goat; the word ‘meke’ meaning goat/sheep and the word ‘datu’ meaning cross. Hence, it is also called Goat’s Leap. Reach the nearest town, Kanakapura via bus from Bangalore and thereafter take another bus to get down at Sangama, the closest bus stand. The adventurous souls may gear up for an exciting bike journey all the way from Bangalore. The notable sightseeing places include the Chunchi Falls (17.7km), and the Sangam of the rivers Arkhavathy and Kavery (3 km), with the temple of Sangameshwara close by. It’s prudent to carry food, for only some snacks and cold drinks may be available at a few shops near the area. 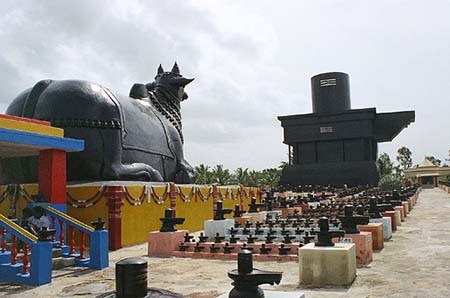 A pilgrim center, Melukote is also referred to by various names from mythology such as Thirunarayanapura, Vedadri, Yathishaila, Narayanadri, and Yadavadri. It is distinguished for featuring some of the oldest rock formations of earth, “Yadavgiri”, as well as a cluster of temples. You may take either a bus or cab from Bangalore to come here. Begin by taking a round of the fsmous temples like Cheluvanarayana Swamy (dedicated to Lord Vishu) and Yoganarasimha Swamy (presided over by Lord Yoga Narasimha). Next, hit the Melkote Temple Wildlife Sanctuary nearby to spot a variety of animals such as langur, leopard, pangolin, bonnet macaque and jungle cat. Lastly, wind up touring the Thonnur Lake. The darshan timings of Yoganarasimha Swamy temple are from 11 am to 1 pm, and again from 5.30 pm to 8 pm, Cheluvanarayana Swamy remains open from 7.30 am to 1 pm, and from 4 pm to 6 pm. Located in Hassan District, this historic town is a Jain pilgrim center, often visited by travelers on their way to Mysore. It gains recognition for containing the tallest monolithic sculpture in the world of that of Lord Bahubali. Housed in the Shravanabelagola Temple, it is carved from a single granite block and commands a height of 58 feet. Take either a bus or a cab from Bangalore to get here. Include in your itinerary short sojourns to the Kalyani pool, the Gomateswara temple, as well as the Chandragiri and Vindhyagiri hills. To reach the temple, you need to climb 620 steps. There is no fixed time for visiting the temple. However, to watch an amazing sunrise, its advisable to check in at 6 am. The island fortress of Srirangapatna comprises the final resting grounds of 2 of India’s great rulers, Tipu Sultan and Hyder Ali. With lush greenery and well laid out spots, it constitutes an ideal romantic gateway from Bangalore. Board a train from Mysore railway station to Srirangapatna. Another way is by taking a KSRTC bus from Mysore. After frequenting the numerous landmarks like Tipu’s Death Place, Sri Ranganathaswamy Temple, and the Lal Mahal Place, you may consider taking a dip in the refreshing water of the Bathing Ghats. Call it a day by touring the Gumbaz and Tipu Sultan’s summer palace, Dariya Daulat Bagh. Cameras and footwear are not allowed inside Tipu’s Death Place. There is a pay toilet but it’s not too clean.The timings of Sri Ranganathaswamy temple are from 7.30 am to 1.30 pm and again from 4 pm to 8 pm. For quick snacks, head to the numerous stalls in the market street near the temple. 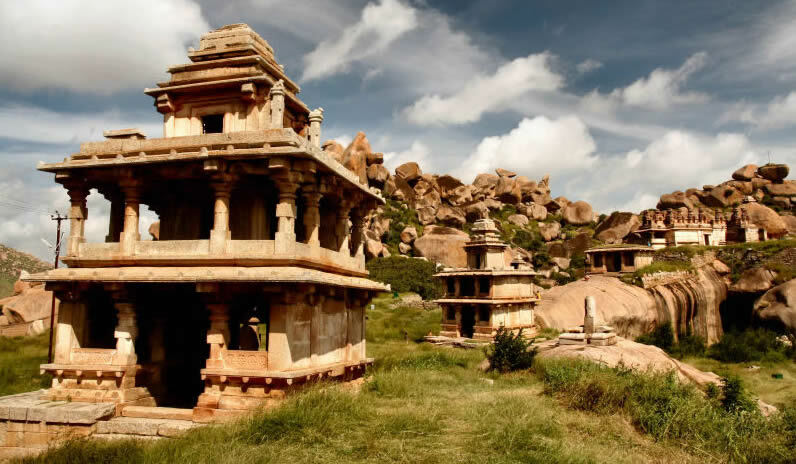 Placed 200 km north of Bangalore, Chitradurga is a 17th-century fort that covers an area of 1500 acres. Hire a taxi from Bangalore to get here within 2 hours. Have sufficient time in hand to go through its 7 concentric fortification walls, 19 gateways, 38 posterior entrances, 35 secret pathways, 4 invisible passages, 2000 watch towers, and water tanks. The fort allows food inside and toilets are also present. However, apart from a few shops of biscuits and cold drinks, there are no restaurants. So, take your lunch along. Also, put on comfortable shoes since there are a lot of steps. Apart from these, Coorg (Madikeri), Mangalore, Ooty, Vellore, and Tirupati are the other interesting places outside Bangalore, but you need to have a 2 or 3 days trip for these are more than 200 km away.